In 1962, ticket in hand, you’re just about to step into the brand new terminal at Wold-Chamberlain Field—now MSP’s Terminal 1-Lindbergh. From the iconic folded plate roof to the gleaming terrazzo floors, everything is new and filled with promise. Fifty-plus years later, check-in and baggage claim have changed dramatically. With exponentially more passengers, e-tickets replacing printed, and travelers checking in online, it’s time to completely reimagine MSP’s “front door” experience. Beginning in 2015 and through 2022, both the ticketing (departures) and baggage claim (arrivals) levels at Terminal 1-Lindbergh will be completely remodeled, essentially providing entirely new facilities without the high cost associated with new construction. Generally, for both levels, the new designs aim to provide better sight lines from one end of the corridor to the other and out to the curbside, additional walk space, and more opportunity for daylight to filter into the spaces. To accomplish this, the inefficient and view-blocking scissor escalators are being eliminated and replaced with a large wall of elevators and a set of escalators on either end, providing an additional 16 feet of walk space, and the mezzanine space above the ticket lobby will be significantly reduced to eliminate the need for columns on the ticketing level. A signature artwork will anchor the newly renovated spaces that travelers and others will be able to see (and touch) from both the arrivals and departures levels. More information about the project can be found here. Provide a more efficient space for airlines to process passengers with their new, self-service check-in kiosks. Provide additional baggage carousel space adequate for the number of checked bags projected to be processed through 2050. Consolidate services, such as restrooms, help desks and food and retail into one central location—on both levels—making it easier to find those amenities and meet up with others. Provide better and more intuitive pathways for moving between levels. Construction of a new security exit off Concourse G at Terminal 1-Lindbergh will begin in 2018, as part of the improvements associated with the arrivals and departures levels. Located between Shoyu restaurant and the first set of moving walkways, this new south security exit will replace the current one located off the Airport Mall across from Stone Arch restaurant and adjacent the restrooms. The new exit provides three benefits to the traveling public. Two elevators are added to this exit, which eliminates the need to walk to the middle of the mall and out to the departures level for an elevator. Removing the existing exit provides room below for two additional baggage carousels – something that will be needed in future years as passenger levels grow. The new exit places passengers at the end of the arrivals level eliminating the possibility of having to backtrack after identifying one’s baggage carousel. Construction began in May 2018. Completion is expected in early 2020. There should be little, if no, impacts to passenger flow during construction. 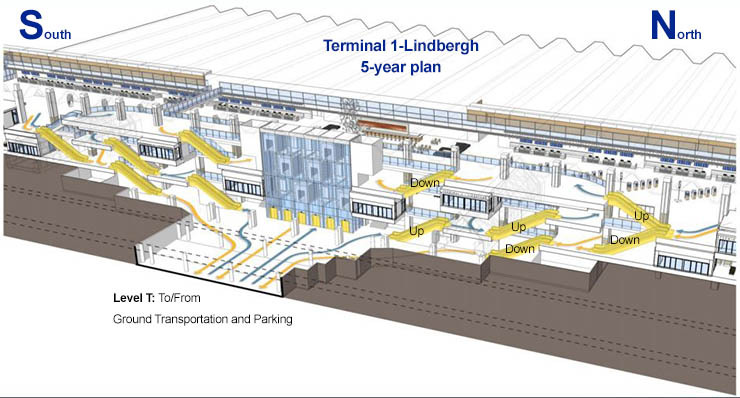 As part of this plan to completely overhaul Terminal 1’s front door experience, from June 2016 through 2019, workers will dismantle all of the existing escalators and elevators that connect the four levels at the entrance to Terminal 1. The project will help reduce congestion in the ticket lobby, provide better sight-lines and bring more daylight into the space. Work began in October 2016 on the north end of the building and continues on the south end in 2018 and 2019. The project is being completed in phases so that adequate facilities are still available when some are taken out of service. In the end, a large, central bank of elevators and a set of escalators on each end will provide the vertical circulation needed to move between floors. Look for additional construction updates here or sign up to receive updates through our e-news service. A new, 10-lane security checkpoint was the first of many changes planned for the ticketing level at Terminal 1-Lindbergh. 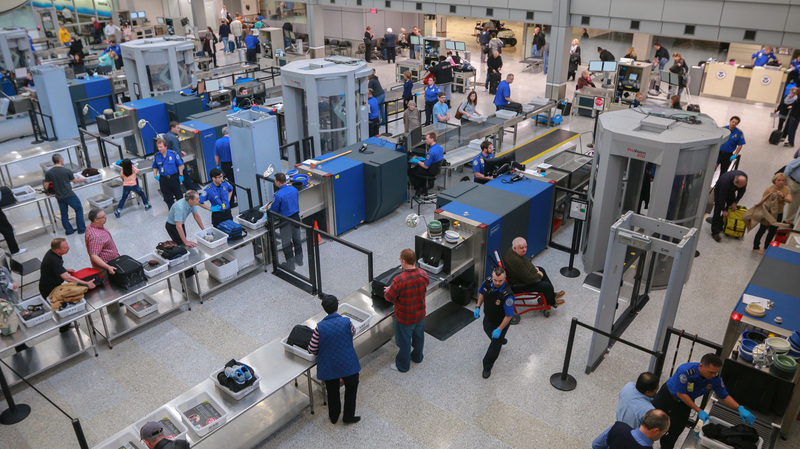 Opened February 16, 2016, this new North Security Checkpoint provides the Transportation Security Administration (TSA) with a very large, brightly lit space in which to process passengers. The new checkpoint took the place of the previous security checkpoints 1, 2, 3 and 4 and offers an additional lane, more queuing space and a larger space to collect belongings and put on shoes, belts and coats once people have been screened. The South Security Checkpoint (previously Checkpoint 6) remains in place with six lanes.